Why Choose the Sports Management Program? Sports management is a growing and exciting field dealing with the business aspects of sports and recreation. Professionals in the sports management field range from public relations specialists to marketing directors, and from facilities managers to compliance coordinators. However, just as with sport itself, competition is stiff for the best sport management positions, and demand is highest for well-trained professionals. Wright State University's Sports Management Program (SMP) offers a solid educational base in the fundamentals of sports management for students interested in a variety of sports-related careers. Those interested in pursuing a master's degree focused on this topic may pursue the Master of Arts in Physical Education: Sport Management program. This course explores the role and impact of athletic programs at the intercollegiate level. 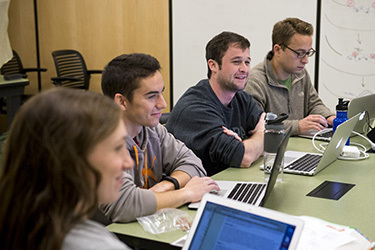 Students study administrative and organizational structure, specialized functions, and professional career opportunities within the field of intercollegiate athletics. Planning, financing, programming, and management are studied, as well as the role of athletics within the educational experience. This course identifies and analyzes the current issues impacting American sports. Emphasis is placed on how those issues and trends affect sport administrators, coaches, and fans. This course explores the academic experience of student athletes in the context of the demands of their sport and how support services are organized and delivered to address distinctive academic needs. This course explores directing and managing the program, services, and business operations of recreation and intramural sports programs. Organization principles and current issues are presented. This course focuses on the NCAA legislative process and bylaws governing the operations of an athletics program. Included topics are those bylaws related to eligibility, amateurism, recruiting and financial aid. This course focuses on the planning, designing, operations and management of physical education, athletics, recreation, health and fitness, and aquatics facilities. Included are the development, planning, scheduling and implementation of daily and major events. This course explores the marketing and public relations aspects of sports programs and sporting events. Current issues and accepted practices and techniques are presented. This field-based experience provides students with advanced practice and supervision in areas of interest in sports management. One official transcript that shows the completion of a degree. Below is a list of various Ohio universities and athletic organizations. This list was created for two reasons. First, we want prospective students to be aware of the considerable number of careers available in athletics. Second, we want to give current students a list of staff directories and home pages so they can contact these sites for potential internships. Also, three websites listed are designed specifically to look for careers and internships in athletics throughout the United States. Campus recreation, intramurals, and club sports are all potential career/internship possibilities at a college/university. A sports management degree doesn’t limit your ability to only work in collegiate or professional sports. Any area that has some type of athletics is a possibility.